Lanie's Little Learners: Who Came to School Today? I have continued working on my "Under the Sea" theme for my classroom. I can hardly believe that it is only 14 DAYS until the start of the new school term. I am both disappointed and excited at the same time. Disappointed because it means less time in the pool but excited to see how the new ideas and activities I created will work this year. The activity I created is all original artwork. The Who Cane to School Today Attendance chart will be part of our morning ritual. The students will come in find their name on the sign-in sheet, sign-in, put their fish in the fishbowl, and then decide how they feel for the day on the How Do I Feel Today Chart. Who Came to School Today? is used for attendance. The children come in and move their fish name tag to the fishbowl. 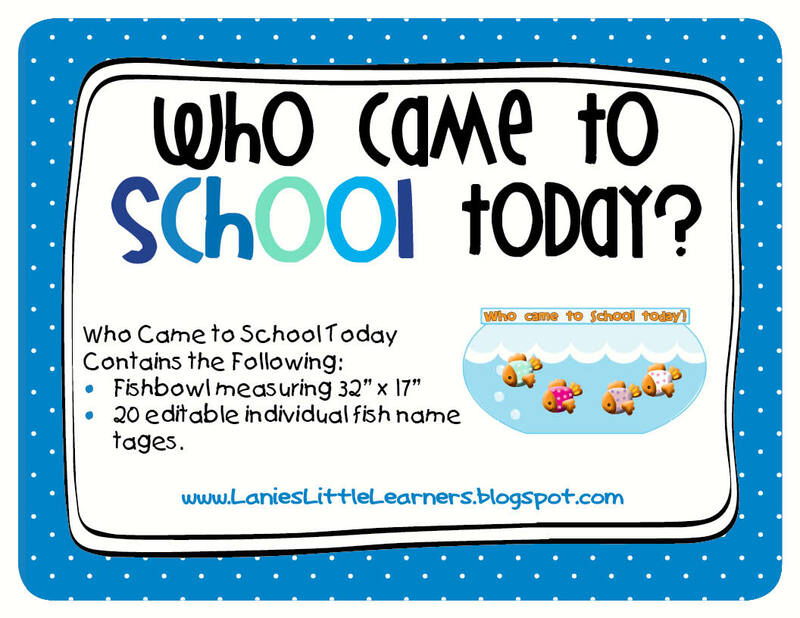 Editable Individual Fish for students’ names. It is suggested to print all pieces on card stock and laminate for durability. To attach the fish names to the chart use the Velcro dots. I also have included Who Came to School Today Fishbowl chart as one piece measuring 32” x 17” on page 15 for those of you who would like to take it to a print shop or Sams Club which also offers large format printing at a reasonable price. 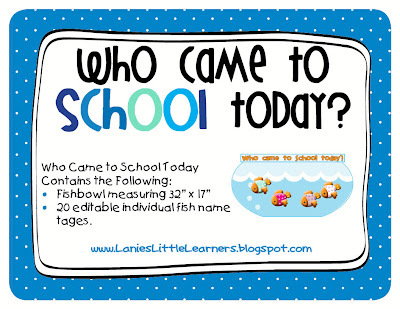 The individual fish for students’ names are (6) to a page and can be printed (2) ways. I created an Adobe Form for the individual fish names where you can type the name of your student directly on the fish. The form is set up to AUTO so it will shrink large names to fit on the fish. The second way is to simply print the individual fish names onto card stock, write individual students’ names, and then laminate for durability.